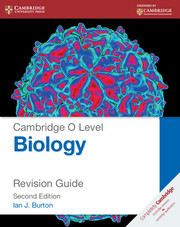 Endorsed by Cambridge International Examinations and fully supporting the requirements of the Cambridge O Level Biology syllabus (5090) for first examination from 2017. This Revision Guide is designed to support students in their preparation for their examinations. It covers all the knowledge and skills students need when preparing for examinations. Written by an experienced examiner of Biology, the text is written in an accessible style with international learners in mind.